It's a shame that one of the world's tastiest foods can be such a pain to prep. 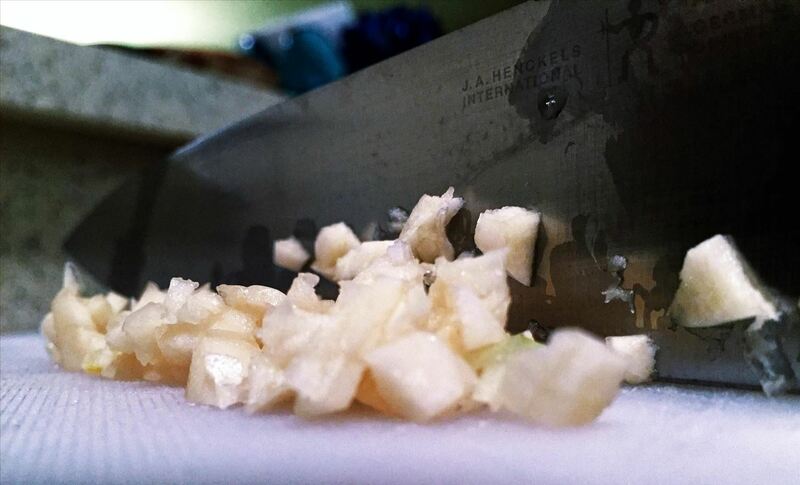 Most cooks are familiar with this conundrum: chopping or crushing garlic releases a pungent liquid that causes bits of garlic to stick your knife and hands, creating a messy affair. So what is going on here? The common assumption is that the garlic is releasing some kind of oil, but the truth is that this liquid rinses away easily in water. Yet one of the basic precepts of chemistry is that oil and water don't mix. 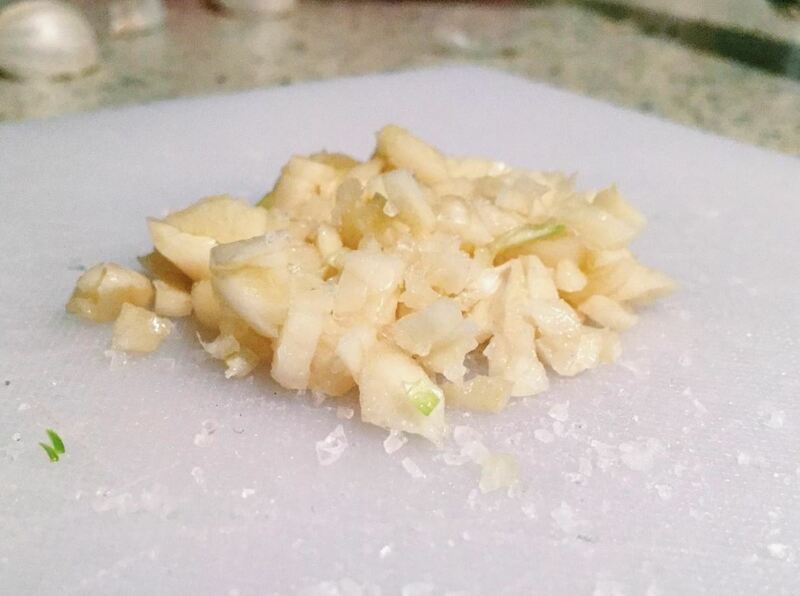 "When crushed or chopped, garlic releases mercaptans from within its cells (sulfur containing compounds). Sulfur readily forms bonds with other amino acids, notably cystine which itself contains a sulfur atom in its chemical structure. When two sulfhydryl groups (S-H) come into close proximity, a disulfide bridge can be formed, creating a relatively strong chemical bond between the two molecules. 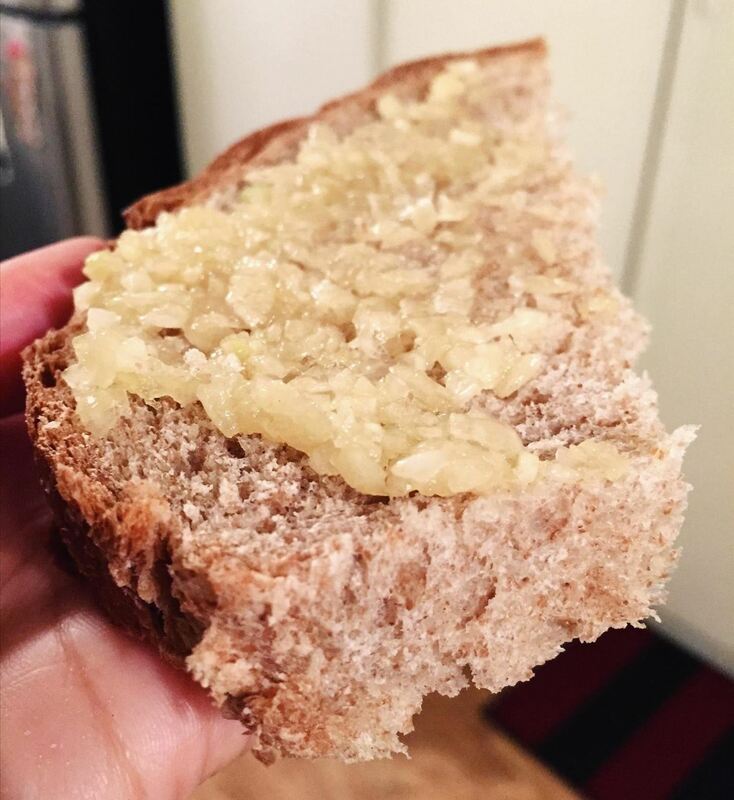 This chemical attraction between the proteins in your skin and the garlic compounds causes the sensation of stickiness, much like hydrolyzed sugar sticking to your skin." Fortunately, there's a simple solution that will keep your knife and hands clean and doubles as a way to boost the flavor of your dish. To keep the stickiness to a minimum, after coarsely slicing through the clove, sprinkle on a pinch of salt. In all likelihood, the salt does two things: creates a physical barrier between the crushed garlic and your knife and hands and disrupts the chemical reaction described by spiceyokooko above. Now, turn your knife so that it's parallel to the board and continue mincing your garlic with the flat side of the blade. The salt acts as an abrasive and further macerates your garlic with half the effort. Remember, under the microscope, salt looks like tiny pyramids. 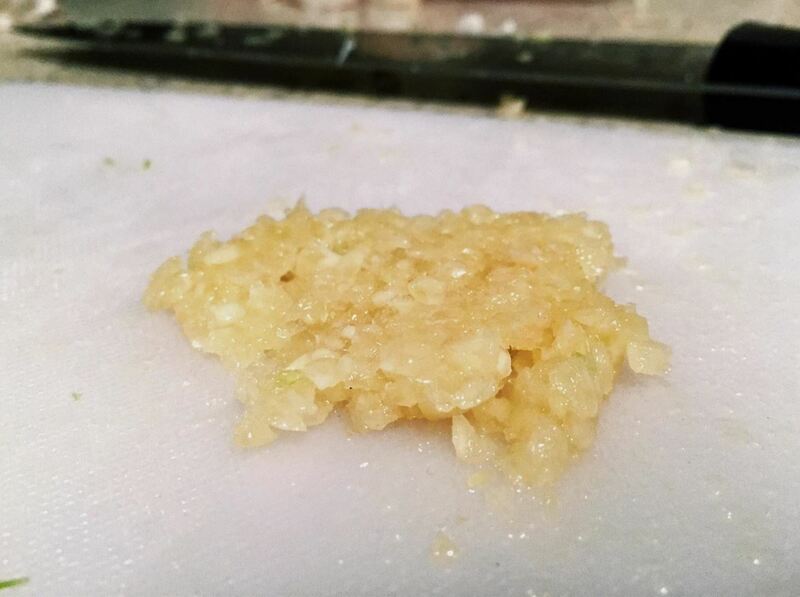 Now, imagine the sharp edges of each of these pyramids pressing into the garlic, giving you that super-fine paste. This is a great hack for people who aren't a fan of garlic presses, which can be a pain to clean. Also, the salt adds a touch of subtle flavor that cuts through the garlic nicely. I'll admit that ever since I learned this nifty trick, I've used it to make paste for my garlic bread at least once a week. We won't judge you if you end up putting this on everything. Dip your fingers lightly in some olive oil (garlic-infused olive oil not required). Coat both flat sides of the blade very lightly. I'd add that you might want to rub the oil into your fingers and hands to make sure you protect them, too. Run both sides of your knife blade under water. The H2O should provide a thin, temporary barrier that will last until you finish chopping your cloves. Learning to prep essential ingredients is easy, if you know how. Learn these easy hacks to peel shallots easily, help garlic cloves slide out of their skins, and chop, mince, and dice onions like a pro.